With all the hype about accuracy in time, it seems that there’s always a place for those who aren’t that worried about it. And for those laid back people there is the nice series of models from Botta and indeed I had one myself – I had the Botta 24, but I sold it on as I found I wasn’t wearing it. A sure sign that a watch is or isn’t for me is that very fact – do I wear it? And in the case of the Botta 24, I didn’t. Not because it was a poor watch, far from it, but rather being a Single Handed dial system, I found, after the initial fascination, that it was just too tiresome to read. I found myself straining to tell the time and that’s just NOT for me. So in the end I sold it on to someone who could manage to live with it. So it was with some interest that I spotted the latest Botta Nova Carbon automatic – which is yet again a Single Handed watch, but with a clear difference. This time there are no tiny figured sub-scales on the dial (I needed glasses to see them on the Botta 24), but rather a neat plain dial divided up into 12 simple (hour) segments. The only indicator – the Hour hand is just visible as a bright green tip which slowly progresses around the dial, through each hour segment and indicates the time accordingly. The center of the dial is black printed on the sapphire crystal. When reading the time, the eye of the wearer is cleverly pulled attention wise into that one hour segment, where the hand is pointing and it is surprisingly easy to approximate the time. Interesting 3 part stainless steel Botta back, with sapphire crystal. Note crown access. The image here shows the time to be approximately 1:40, though the wearer does have to know whether it’s day or night and fortunately I can still just about manage that! 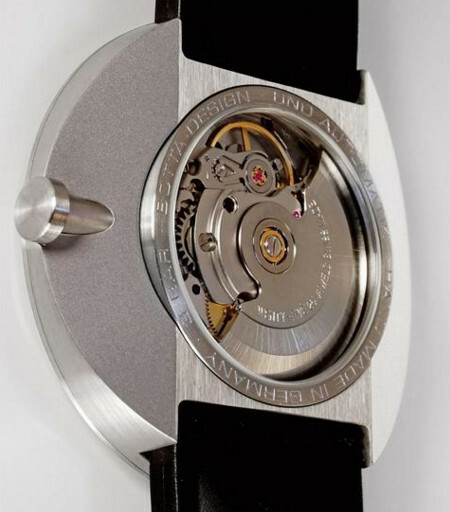 The watch is powered by the Swiss 2824-2 automatic caliber movement, a most reliable movement, which includes an Incabloc anti-shock plus 25 ruby bearings. I note that Botta hand adjust every movement over a few days, prior to retail to maximize accuracy. A dual domed Sapphire crystal includes anti-reflection coatings and with a complimentary exhibition back also in Sapphire. Fully screwed stainless steel 3 part case with dimensions of 44 mm x 8.8 mm is lightweight at just 75 g, means this is a very neat watch which sits extremely flat on the wrist. 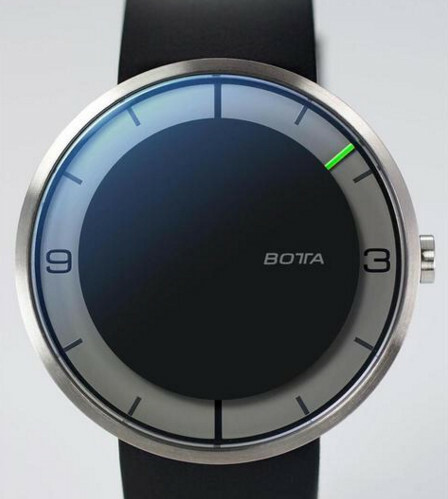 Water resistance like most other Botta models is 3 atm. I note owing to the case back shape (see image) the crown is much easier to access than the Botta 24 which was very small and too smooth to grip. So an intriguing watch from Botta and yet another variation on the Single Handed display system and I have the feeling that, as it is, for want of a better word I’ll call it an “approximate” watch, I don’t envisage I’d suffer eye strain this time as a result of reading it. In fact it’s really very easy – a quick glance and it’s obviously around 1:40. Could I live with it? well I thought I could with the Botta 24 and didn’t manage it, but this one certainly has a much better chance. However priced at over $1000 and without a Day or Date, would I get my money’s worth. Note 1 – The Botta Nova Carbon is also available in Quartz at approximately $540 – but my reservations I’m afraid still apply – novelty or practicality? Note 2 – From a collectors point of view, “designer” watches such as the Botta all tend to suffer in the pre-owned market. Not really sure why, though in many cases Designer watches are showing off perhaps a novelty aspect of a watch and often something very different. It is unfortunately true also that most people, including myself, have a short attention span when it comes to novelties – in that the novelty wears off! From experience I can say that selling on “designer” models is never easy. Even though I was reasonably lucky when I sold on my Botta 24, it certainly didn’t reach the value that I personally put on it. But that’s life . . . .